Frame pad There are 46 products. Pack of 20 spare elastics for your trampoline frame pad. Frame pad for Oxygen 180 trampoline. 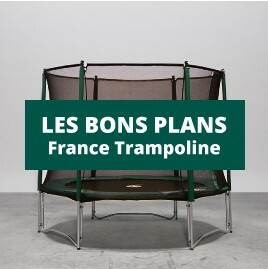 A 2.44 m frame pad for your garden trampoline. Protect your garden trampoline with our 3.05 m frame pad. 100% safety with this 3.66 m garden trampoline frame pad. Use our 3.96 m frame pad on your trampoline. A frame pad adapted to round trampolines of 4.27 m in diameter. Replace your damaged Ø 4,57 m frame pad. Thick, round frame pad for 3.60 m trampoline. Change your 13ft frame pad for 100% safety on your trampoline. Replace the frame pad on your 430 garden trampoline for optimal safety. Renew the frame pad on your round 4.57 m trampoline with 230 mm long springs. Change the frame pad on your 4.90 m recreational trampoline. Thick frame pad for octagonal trampolines of 3.90 m.
Frame pads for all octagonal 4.27 by 3.96 m trampolines. Large, thick frame pad to protect your springs on your octagonal trampoline of 4.57 by 4.27 m.